On Sunday, the leader of Ukraine, Petro Poroshenko, arrived at the Olympic Stadium to hold a debate with presidential candidate Vladimir Zelensky. The president’s opponent was not expected to appear at the event, as he had long ago stated that he was ready to answer all the questions of Poroshenko only on April 19. It is reported that only the “selected” media were able to attend the debates, while the disloyal authorities were denied accreditation. According to Ukrainian legislation, the debate should take place on the last Friday before the day of the second vote between 19 and 22 hours on live television. The second round of presidential elections in Ukraine will be held on Sunday, April 21. If the debates are held at the stadium, then formally they do not fit into the legislation, and they can be considered “informal.” Initially, the parties agreed to hold a debate on April 19, but later the president announced that he was waiting for Zelensky a week earlier. For the visit Poroshenko stadium NSK “Olympic” prepared in detail. Ever since Saturday evening they installed a fence around the stadium and began to erect a stage. Two monitors were mounted on it showing an image of a man with a mohawk-like haircut, similar to the president, and the words “Underground with you”. A black tent with agitation was set up near the entrance to the complex, but not for Poroshenko, but against Zelensky. On Sunday morning, police and National Guard officers filled out the area. But the activists of the National Corps Party, who, before the first round, followed Poroshenko in all his performances, did not take part in the actions near the stadium. According to the leader of the nationalists, Andrei Beletsky, the party fear power provocations that can be arranged near the stadium. 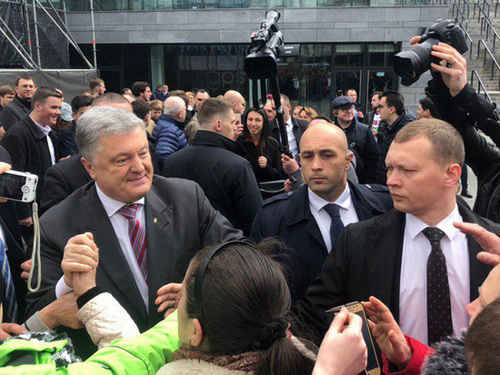 Poroshenko arrived at the Olympic Stadium at 2 pm and said he would wait for his opponent until 3 pm True, Zelensky has said several times that he will not go to the debate. In addition, he said that a provocation was being prepared against him. The comic stressed that he would answer all the president’s questions next Friday. Apparently, Poroshenko categorically does not like this answer, and he promised to call his opponent to the debate whenever possible. Speaking to his supporters, the president said that Ukraine “does not want to buy a cat in a bag” and should choose “a real president and commander in chief.” Most of the time Poroshenko answered questions about Zelensky. He admitted that he does not have reliable information that his rival is a drug addict. And if the comedian wins the election, then Poroshenko will come to terms with the will of the Ukrainian people. Now the president is preparing the ground so as not to hold a debate with Zelensky. In addition, a number of media outlets were not allowed to enter Poroshenko’s action, including Vesti and the 1 + 1 channel. This suggests that even at his own meeting, the president is not able to answer uncomfortable questions.